Susan Anenberg, an associate professor at The George Washington University in Washington, D.C., has a Ph.D. in Environmental Science and Engineering, Environmental Policy. Previously, Anenberg worked for the Environmental Protection Agency, and also was a co-founder and partner at Environmental Health Analytics, LLC. She is known for her expertise in public health and environmental sciences, so Planet Forward sat down for a Q&A to find out about the health implications that environmental pollution can have. Planet Forward: You’re a teacher here at George Washington University? Susan Anenberg: Yes, I just started as an associate professor here about a month ago. I’m currently developing a new course on global air pollution, climate change, health impacts, and public policy. That will be taught this summer for the first time. PF: What made you want to pursue a career in health and environmental science? Anenberg: I was an undergrad at Northwestern University, and I was pre-med and working nights at an emergency room. I realized that I was seeing the same patients over and over again at the hospital. It occurred to me that if we can take care of some of the more underlying factors that affect people’s health, on a population basis, rather than an individual basis, we would do more than just treating the symptoms and actually prevent the health impacts from occurring in the first place. So that’s what led me to want to be involved with public health. I was also personally interested in climate change and global air pollution, which were both rising in prominence at the time. I realized I could kind of marry the two together and work toward improving public health by tackling climate change and air pollution. PF: I myself live in Buffalo, NY, which has a high rate of cancer within the area, as well as a high rate of air pollution. 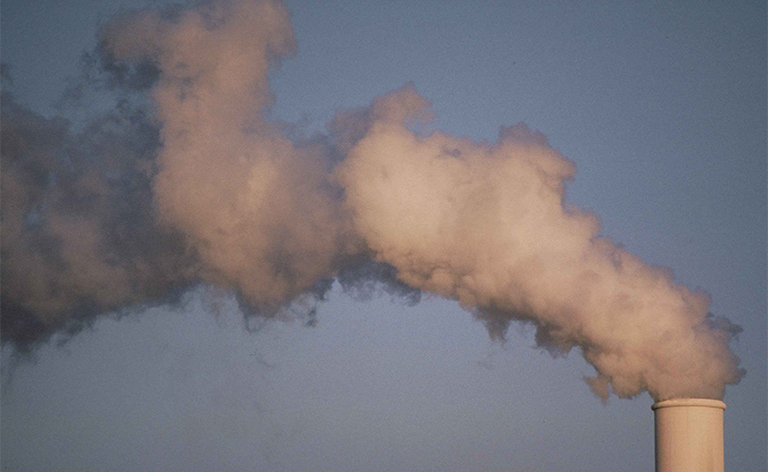 Do you think that air pollution rates have a strong correlation to the cancer rates within a community? Anenberg: I do. Air pollution has been studied, and studied, and studied over the last say, 40 years or more throughout this country and the world. I always joke that fine particles in the air and ground level ozone, two very ubiquitous and common pollutants, are probably the most studied pollutants in environmental health because they go back to the 1970s in terms of linking pollutants with health. Time and time again we see results coming out of these studies from individual cities, multiple cities, and even multiple countries showing that these pollutants are associated with higher rates of lung cancer, cardiovascular disease, and respiratory disease. We are even seeing some novel health outcomes that are now being associated with air pollution exposure, including diabetes and neurological disorders. PF: So what particles or chemicals would you consider to be the largest contributors to health implications in mass populations? Anenberg: It appears that particles in the atmosphere caused by incomplete combustion of fuel — those that are released during incomplete combustion of fuels, which could be anything from vehicles burning gasoline or diesel, to a coal-fired power plant, to the fireplace that you use to heat your home — are the most strongly associated with health impacts and really dominate the burden of disease caused by these environmental pollutants. PF: In regards to your research with the EPA, what did you work on and how extensive is the regulatory process? It seems that there is a public misconception that the EPA simply pushes out environmental regulations on whatever it feels like, with discussion going no further than a lunch conversation. Anenberg: Actually, it is incredibly complicated. In fact, when I started at the EPA I was a graduate student doing my Ph.D., and I was realizing during this time how hard it was to do research and to get published in academic literature, you have to go through a peer-review process, and it’s not an easy thing. I thought when I joined the EPA, it was just going to be easy to construct policy, and it was not going to be as hard as conducting scientific research. Boy was I wrong! It is really hard to develop new policy in this country. I think that there is good reason for that. These are very costly regulations that the EPA handles, but they have massive public health benefits, so they are very essential to have in place. The process is extremely complicated, it starts with a very, very thorough review of the scientific literature including toxicology, epidemiology, and an entire body of literature that has examined the influence of pollutants on public health. This is called an integrated science assessment, which typically runs about a 1,000 pages for each individual pollutant. Based on the results of the assessment, the EPA then produces a risk and exposure assessment, which is on the order of about 500 pages, where they very thoroughly assess the influence of current levels of air pollution in the atmosphere on public health, so how much are populations around the country experiencing risk from air pollution. And then following that 500 page document, there is a regulatory-impact analysis. PF: Which would be a cost-benefit analysis, correct? Anenberg: Yes, that is a cost-benefit analysis where they try to estimate the full cost and health benefits resulting from lowering an air-quality standard. In total, the process takes years to complete and produces thousands of pages of analysis. And at every step along the way there are multiple levels of public review and public comment periods where people from all walks of life come to meet with the EPA to bring their research and perspective into it. In total, it’s just a very comprehensive and thorough process that the EPA does not take lightly. PF: And you obviously think these emission regulations are important? Anenberg: Absolutely. Air pollution is currently considered to be the worst environmental health risk factor on a global scale. It is a massive public health problem that affects developing countries and developed countries alike and is essential to manage, which can ensure that people are living healthy lives. PF: When we talk about the effects of climate change, we often talk about the economic implications. However, how do you think climate change will affect our health on a global scale? Anenberg: That’s a great question. Health has not been a key element around the discussions of climate change over the last 20 to 30 years. I think that’s a shame because there are a lot of different pathways by which climate will affect health. The situation is changing now. The U.S. government, under the Obama administration, started addressing the health impacts of climate change and has written several very high profile, comprehensive reports about the health effects of climate change. But more can be done. One way to do that would be to build health into cost-benefit analyses that relate to regulating greenhouse gases, rather than just the ecosystem and economic impacts. Some of the ways climate change will affect health is very varied. It can influence heat related stress, vector-borne diseases, air quality. [Climate change could] make it harder to achieve the low levels of air pollution necessary to ensure people are living healthy lives. It could lead to more dust in the atmosphere, more wildfires — there are just a lot of different ways climate change might influence health. We know very little about it at this point but it is growing in momentum. PF: It seems that for a long time the environment has been viewed as this sort of waste sink. Do you think this attitude over the past couple of decades is changing? Why or why not? Anenberg: I do think so. I think there is now recognition that to lead healthy lives we have to take care of our planet. This is the only planet we live on. There is this new frame of thinking that has evolved over just the past few years that some call “one health” or “planetary health” that taking care of our environment is really essential to safeguarding public health. This can be through making sure we are growing the right crops and making sure these crops are able to grow so we can sustain nutrition for people around the world. It could be ensuring that our glaciers aren’t melting so quickly that people are losing their access to clean water used for drinking water and irrigation. So, our public health is very intertwined with the state of the environment and I do think that is entering the conscience of the public as well. PF: Thank you. My final question here is for citizens concerned about the health and climate effects in their own communities. What is the best way to address these grievances? Anenberg: One of my favorite aspects of working on the issue of climate change, is that it is so multi-faceted. There are so many different way you can approach it. You can take the legal angle, you can come from a scientific standpoint — looking at climate science and how climate change will affect ecosystems and public health in your community. You can be a community organizer, you can run for public office. You can bring an economic skill set [to the issue]. There are just so many different angles to address this problem, and we need so many different [experts] to address it, because it is such a large problem. I think the opportunities for engagement are just endless.